President Nursultan Nazarbayev is certainly not the first leader to spearhead the design and construction of new buildings, but he may be the first to oversee the construction of an entirely new capital city in less than 20 years. The city of Astana is meticulously planned, with every building, monument and street name bearing symbolic significance. Out of all of Astana's new monuments, the Kazak Yeli Monument is the most revealing testament to Kazakhstan's new national identity and the Kazakh perception of their history. In this post, I have attached multiple photos of the monument and provided my commentary -- a photo essay. I am neither an art expert nor do I know the real reasons as to why each figure was selected to be in the monument. As someone who follows Central Asian affairs, I consider this monument to be a significant, tangible and concrete manifestation of Kazakhstan's national identity. The Kazak Yeli (Kazakh Country) Monument is located across the street from the Palace of Peace and Accord, in between the arts university and the Palace of Independence. The monument is an ivory stone row of columns with a tall, central pillar topped by an eagle. At the pillar's base is a circular platform with life-size figurines. The combination of Classical architectural elements and symbols of Inner Eurasian antiquity evident in the Kazakh Yeli monument crystallizes the future of Kazakhstan: a rising power ready to not only join, but also change, the global political-economic order. In the center, is the Kazak Yeli Monument. The blue, round building on the left is the Shabyt, which houses an arts university. On the right is the Palace of Independence. The selection of the figures as symbols in the Kazak Yeli monument illustrates how Kazakh leaders incorporated traditional Kazakh cultural symbols from their nomadic history as well as icons from their recent Soviet history. At the top of the monument is a Kazakh woman wearing a kimeshek, the traditional headdress of a married woman. The kimeshek was worn by various Kazakh clans, as well as Karakalpaks and other Inner Eurasian peoples. She is also wearing a traditional-styled dress. Despite her traditional Central Asian attire, her body pose and the drape of her dress is reminiscent of a Grecian goddess. Just by looking at the figure, you can sense the wind blowing her dress by the figure's contrapposto and the dramatic drapery. 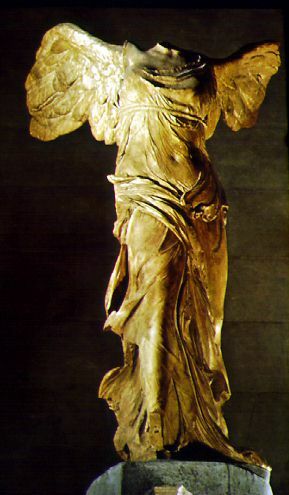 Her figure reminds me of Winged Nike of Samonthrace (right). The artistic combination of Central Asian and Ancient Greek promote a message that glorifies Kazakh traditional culture while embraces the rationalism and democratic ethos of Ancient Greece. After all, Ancient Greece and Rome are the bedrocks of Western civilization. The U.S., France, among other countries, have embraced national symbols of females in Greek and Roman-style drapery. The female figure in this monument crystallizes Kazakhstan's adaptation of a new set of norms in the post-Soviet world as well as its retainment of traditional ethnic identity. To the left, a young woman carrying a book to symbolize work, education and industry. Then there are two men wearing shapans, a traditional long coat, and tymaks, fur hats. A Kazakh gentleman playing the dombra, the national instrument of the Republic of Kazakhstan. The dombra is one of many long-necked lutes played throughout Central Asia. It is a symbol of Central Asian culture and history. The roman arch and white brick is reminiscent of Classical architecture from ancient Greece and Rome. Throughout history, many other leaders, Palladio, Thomas Jefferson, among others, replicated and modified architecture from ancient Greece. By incorporating classical elements into a new national statue, Nazarbayev is sending a message to the world that Kazakhstan is a rising power and eager to adopt the norms, patterns of behavior and beliefs of the modern world, abandoning the country's Soviet-era ideology. Instead of an Ionic or Corinthian capital, the columns on the Kazak Yeli monument contain a uniquely-Kazakh geometric pattern. This is an example of how architectural elements from the West combine with Inner Eurasian motifs to create a unique aesthetic. The young man and woman with a child in their arms symbolizes the centrality of the family. Strong familial ties and an extensive kinship network are traditional Kazakh norms that are still important today. Girls tend to marry in their early 20s and rear multiple children. Living with a 6-member Kazakh family in a three-room Khrushchev-era apartment, I learned how the combination of how living in a small space promotes cohesion, trust and solidarity between family members. All things are shared and the notion of exclusive private ownership of a purse, bed or book, does not exist. Everything is shared with the family. A young Kazakh couple dressed in modern attire symbolizes the continued importance of the family. A Kazakh boxer. Boxing is the most popular sport in Kazakhstan and the country's players perform extraordinarily well in international matches, including the Olympics. A Kazakh boxer is a modern symbol that is a more relatable and tangible national symbol to younger Kazakhs than an older man wearing a shapan.